NEW ORLEANS – Things never seem to stay the same from one week to the next in the NCAA Division I Women’s Outdoor Track & Field National Team Rankings. 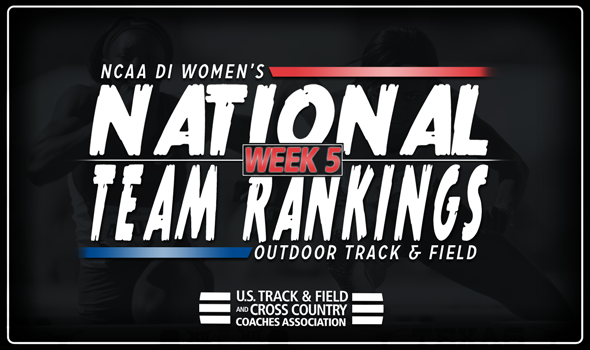 After a weekend of action-packed track & field meets, Oregon and Arkansas each moved up a spot in the top-five, while LSU held onto the top ranking, announced the U.S. Track & Field and Cross Country Coaches Association (USTFCCCA) on Monday. Oregon returned to second in the rankings after sitting there during the first three rankings of the season. The Ducks then fell to fourth in week three before moving up to third a week ago. Oregon’s one-spot rise from this past week can be attributed to its performance at the Desert Heat Classic. Lauren Rain Williams notched the third-best 200 time in NCAA Division I this year at 22.51 and Alaysha Johnson added the sixth-fastest 100 hurdle time at 12.75. Also, the Ducks’ 4×100 relay squad ran a 42.70, good for fourth on the Descending Order List. Arkansas didn’t have to go far this past weekend to hit marks it needed to jump into fourth. The Razorbacks hosted the Arkansas National Relay Championships, where Janeek Brown and Taliyah Brooks notched times of 12.73 and 12.82, respectively, in the 100 hurdles. Both of those times sit in the top-10 of the NCAA Division I Descending Order List. Victoria Hoggard also recorded a 4.51m (14-9½) in the pole vault, placing her third in NCAA Division I this season. LSU held onto the top spot in the rankings after its 4×100 relay squad ran the fastest time in NCAA Division I this year at 42.49 at the LSU Invitational this past weekend. Falling in the top-five were Southern California and Georgia. Both squads slipped one spot each to third and fifth, respectively. A pair of SEC programs in Texas A&M and Florida each jumped a spot in the top-10, moving up to seventh and eighth respectively. The Aggies competed at the LSU Invitational, where it notched three top-10 NCAA Division I Descending Order List marks. Sammy Watson posted a 2:02.49 in the 800, good for third in the nation, while Kristen Clark’s 56.20m (184-4) in the javelin sits fourth. The Aggies’ 4×400 relay squad also notched the fourth-best time in the nation in the event with a time of 3:30.53. The Gators hit four top-10 NCAA Division I Descending Order List marks at the Arkansas National Relay Championships. Yanis David continued her outstanding junior campaign with the second-best triple jump mark in the nation this year at 14.13m (46-4¼). Avione Allgood’s 55.73m (182-10) in the javelin sits sixth on the Descending Order List, as does Darrielle McQueen’s long jump mark of 6.54m (21-5½). The Gators’ 4×400 relay team also ran a 3:31.21, good for fifth in the nation. Kentucky (sixth) and Minnesota (10th) remained in their respective spots from a week ago. Stanford fell two spots to ninth to round out the top-10.